Duris S 10 is the latest addition to the Chip Array SMD family (CAS) from Osram Opto Semiconductors. 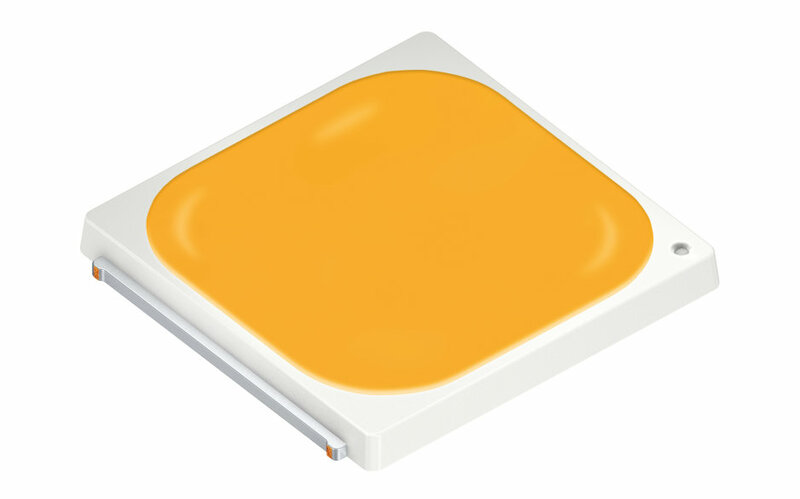 This new LED is characterized by high efficiency, high light output and uniform color appearance. Efficient SMD technology (surface mounted device) makes assembly simple. These properties lead to significant cost savings in system and optic design, which may be as high as 30 percent depending on the particular customer application. The new Duris has a compact footprint and is available in two output classes with up to 1400 lumen. It simplifies the design of lamps and luminaires and is ideal for use in spotlights, downlights, and directional and omnidirectional retrofits. “The new Duris S 10 with its typical luminous flux packages of 1050 and 1400 lumen and a light-emitting surface of only 7.7 mm in diameter forms the basis for compact optics and extremely narrow beam angles”, explained Vincent Lee, Product Manager at Osram Opto Semiconductors. The lumen packages have been chosen specifically for standard applications such as MR16 retrofits, and enable lamp and luminaire designs to be created on the basis of a single Duris S 10. This in turn helps prevent multiple shadow effects – a clear advantage over the frequently used multi-LED clusters. Both single-spot versions have the same footprint of 7.0 mm x 7.0 mm, offering flexibility in the design of compact luminaires with high luminous flux. Thanks to the small size of the LED, the design of the optics is also simpler, which means that it is easier to integrate standard accessories such as lenses and reflectors. Both Duris S 10 CAS LEDs are binned according to the familiar MacAdam ellipses, resulting in a more uniform color appearance. In view of the surface-mounted design of the LED, a pc board has to be incorporated in the luminaire. This does, however, open up numerous design options such as integrating thermal fuses, connectors or driver components on the LED board. In standard CoB (Chip-on-Board) solutions up to now, these functions have had to be accommodated on a separate pc board, taking up more space. Compared in particular to these established solutions, the two new Duris S 10 LEDs with their many benefits are excellent alternatives in this luminous flux category. For more information on the Duris S series and the entire product family please refer to the product catalog.